We interviewed our product specialist and beautician Diana about the use of Marie-José Eyebrow Henna. In this blog she shares all her tips and experiences, to create beautiful, full eyebrows with our henna eyebrow tint. You can't get around it anymore. Henna Brows are hot. Our eyebrow henna is also the most popular eyebrow tint ever. Not surprising, when you see the results that you can achieve with it. Beautiful, full eyebrows, because the henna stays on the skin for up to 2 weeks and on the eyebrow hairs for up to 6 weeks. And the application system is very easy. You really don't need a training course for this. Due to its great popularity, we get loads of questions about the use and results attained with eyebrow henna in practice. These questions can be properly answered by our product specialist and beauty professional, Diana. In addition to her work for Marie-José & Co, she also runs her own beauty salon. This year, she will have been doing it for 10 years already. Diana has extensive experience with eyebrow tinting. And can answer all your questions from practical experience. In this blog we let Diana speak and share the experience she has gained with henna eyebrow tinting. So, she answers the most frequently asked questions. Diana has been using this Eyebrow Henna since its introduction in 2017. In fact, she co-developed the product. "Right from the initial trials, I was very excited about the results. I couldn't wait until we had it in stock, so I could use it in my beauty salon," says Diana. What are the benefits of tinting with Eyebrow Henna? "The biggest advantage, I find, is that the henna powder is packaged in sachets, an amount sufficient for 1 treatment. So you don't need to open a large tin, or bag. Because that's ultimately at the expense of the powder's shelf-life. As a matter of fact, with 1 such sachet, I can do 2 treatments in practice. If you are really frugal, you can even manage to get 3 treatments from a sachet. This immediately reduces the cost of the treatment. I seal the bag with a piece of tape. In this way, I ensure that I can store the powder for another 1 to 2 weeks." "Another great advantage is that the powder mixes with water. Add a few drops with a pipette. Then just stir with an angle brush. And it's ready! It doesn't get easier than that. By the way, I use the Marie-José Tool Kit. It includes a little glass mixing bowl, a pipette, and an angle brush." Are there also disadvantages to using Eyebrow Henna? "A disadvantage may be that the henna powder swirls around if you shake it too boisterously from the sachet into the mixing bowl. Or lands next to it. Actually, this can also happen if you use Godefroy. The capsules are often hard to open. That's why I will always lay a dental bib under it to protect my work surface. If the powder ends up on the work surface, or any other surface, it would be difficult to remove, without staining it. 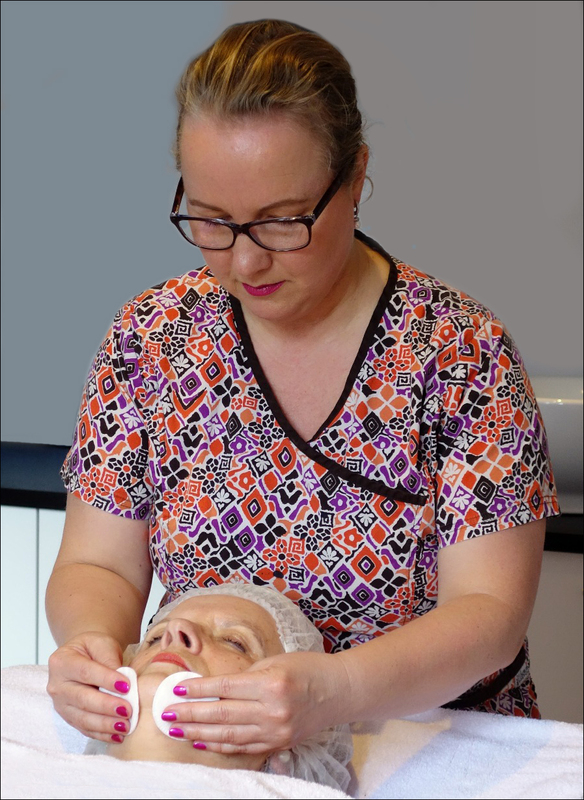 Before each treatment, I actually get all my various items ready, so that I have everything at hand: mixing bowl, angle brush, powder, pipette and a glass of water to fill the pipette." What items do you use for tinting eyebrows? "Before I start the treatment I place a "Scrummi" disposable towel on the client's chest, to protect their clothing. I always wear an apron. And, of course, nitrile disposable gloves to protect my hands. I also always first clean the skin with a good exfoliant. By doing this, I remove the dead skin cells. I put a little alcohol onto a cotton pad and de-grease the eyebrows and skin, so that the henna tint can take properly. I apply RefectoCil Skin Protection Cream around the eyebrows. If I color beyond the lines, I remove the tint immediately with a dry cotton pad. Once the tint is absorbed, I remove the remaining residue gently, with a wet cotton pad. 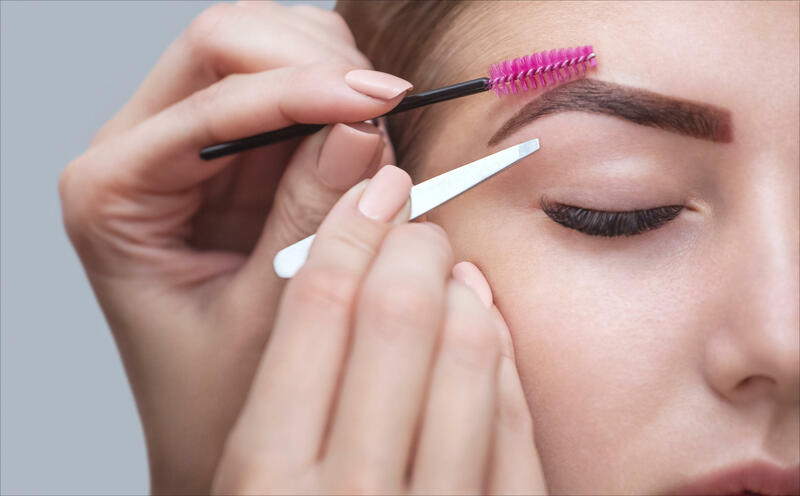 After that you can start styling the eyebrows; such as tweezing, trimming and waxing." Why must the henna powder be mixed with water, and not with an oxidant? "Henna is a natural product. The powder, with just a few drops of water, makes a paste. After that, the henna can be applied to the skin and the hairs. No chemical process is necessary before the tint is ready for use. With other eyebrow tints such as RefectoCil and Godefroy, this is necessary and therefore an oxidant is added to the powder to make the tint ready for use." Are the 5 henna colors sufficient to ensure that all clients attain the right color? "In practice, I cope well with the 5 colors. If one of the standard colors doesn't match precisely, I mix 2 colors together. But that's actually rare." Do you always tint the skin as well? "That depends on the client's wishes. There are plenty of customers who don't go for the full eyebrows, but only have the hairs dyed. And for this, I prefer a natural product. In such cases, Marie-José Eyebrow Henna is always my first choice." Do you also use other types of tints in your salon? "Yes, I also tint with RefectoCil Classic. Or with RefectoCil Sensitive, for clients with sensitive skin. The advantage of RefectoCil is that you can also tint eyelashes. And, of course, I also use Godefroy, for people who don't have much time. Yet, for customers who wish to have full eyebrows, I always use the Marie-José Eyebrow Henna." Is there a difference in price between a henna treatment and other tints? "A henna treatment lasts longer than a treatment with RefectoCil or Godefroy. I also call it a brow treatment, because I scrub and tweeze. And, of course, I tint the skin as well. Therefore, it is a detailed and relatively long treatment. I have the following advice for my fellow beauticians and eyebrow specialists. 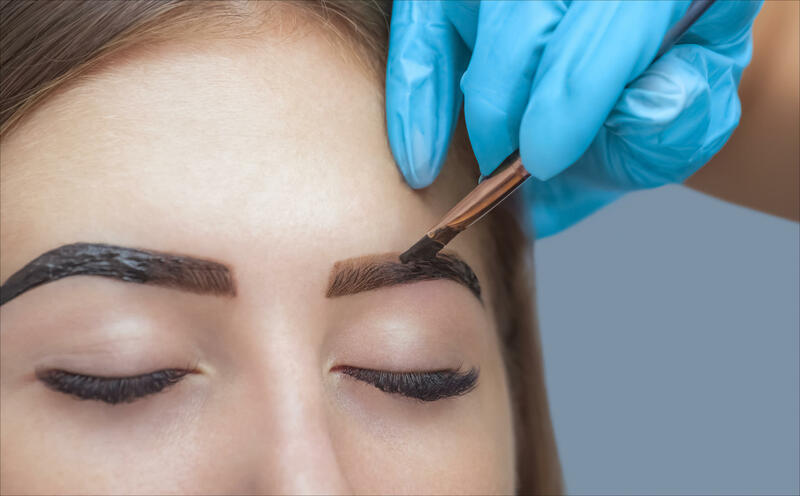 I think a good rule of thumb is to calculate at least 25% more for your client's brow treatment, as opposed to tinting or treating the eyebrows with a different system." Do you provide a guarantee as to how long the tint will remain on the skin? "No! If, and how long, the tint remains on the skin, depends on the skin type and maintenance by the client. With oily skins, it's possible that the tint won't take very well, and therefore doesn't adhere so well either. When I have a client with an oily skin, I immediately point out that the result may be less than expected. I also recommend that the client minimizes the use of oil-based products, which applies to most cosmetic products, on or around the eyebrows. It is also important to keep the eyebrows dry for 24 hours after the treatment. And I advise my clients not to sit in the sun for too long." Do you always achieve a lovely even result with eyebrow henna? "Like I already mentioned, for an optimal effect, I exfoliate the skin beforehand to remove the dead skin cells. For example, scar tissue can also cause the tint not to take properly on that particular spot. For a visually attractive result, I also work in with a brow pencil or eyebrow powder in such cases. The client can also easily do this at home." In our practical step-by-step plan, you can read how to get the best out of the Marie-José Eyebrow Henna tint. Do you have any more questions or tips? Or do you think you really need some training? These were the main questions we asked Diana. But maybe you have still some more questions. Or perhaps you have a few tips, from your practical experience? Please let us know via our contact form, or by sending an email to support@marie-jose.co. Would you also like to use Marie-José Eyebrow Henna, but you don't yet feel confident? Then please also contact us. We can provide you with more info. Yes we always advise to do a patch test. You do not special qualifications to dye eyebrows with henna. If you can dye with for example Refectocil, you can do it with our henna too, It's easy!